The basics of looking for a place to live have been changed by the internet. Whereas once looking in the newspaper and calling a realtor were the places to start in finding out where to look and what to look for, today the internet offers another portal for home buyers or renters. 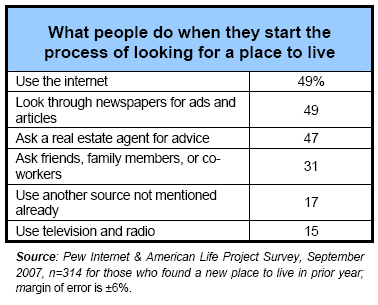 In this portion of the report, we examine use of the internet among the 17% of respondents who said they found a new place to live in the previous year. One-third (32%) bought a house, condominium, or co-op, while 61% rented. Half (53%) of those who found a new place to live moved to a new city. Respondents who were directed to questions on searching for a place to live are the youngest and most ethnically diverse of any of the three topic-specific modules. The median age is 32, 18% are English-speaking Hispanics, and 16% are African Americans. Internet usage levels are above average, with 80% being internet users and 61% having broadband at home. The internet is front and center when people start to look for a new place to live. When asked about the things they did to get going with their housing search, respondents cast their nets widely. They were equally likely to say they used the internet, newspaper ads, or a real estate agent. 60% of buyers consulted the internet during their search, compared to 43% of renters who did this. 60% of buyers consulted friends, family, or co-workers, compared to 16% of renters who did this. 49% of buyers used a real estate agent, while 48% of renters did. 39% of buyers used the newspaper in their search, while 57% of renters did. 19% of buyers cited a source not mentioned, while 18% of renters did. 12% of buyers consulted the radio or TV in their search, compared to 17% of renters. When those who had used the internet to get some information on where to search for an apartment or house were asked specifically what they did, here is what they said. 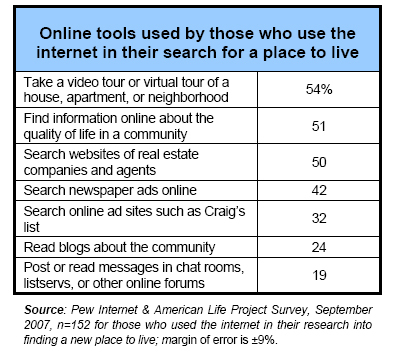 Three-quarters (76%) of those who had used the internet for their housing search took advantage of at least two the means listed above, 57% did at least three of them, and 31% tried at least four. The typical housing searcher who used the internet in his research tried 3 of them. Online information economizes on search costs when house or apartment shopping. Those who use the internet in their housing search see payoffs mainly in lower search costs and in getting a feel for the places they may live. Fully 58% say that information found online gave them a good introduction to their new community, and 57% said it reduced the number of houses or apartments they looked at. Overall, 76% of respondents say that online information helped them in one of these two key ways in structuring their real estate search. 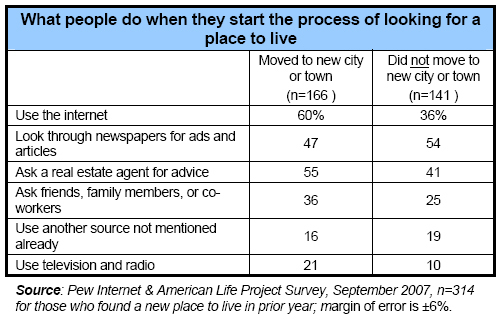 Additionally, 27% say that online information actually changed the neighborhood in which they were planning to live. Online information also helps in the pocketbook for some people. Among those who used the internet to do research on a place to live, 29% said they believe online information helped them get a better price on their house or apartment. Some 35% of buyers thought online resources helped them get a better price, while 28% of renters said this. 23% of those who used the internet in their research said it had a major impact. 36% said it had a minor impact. 42% said it had no impact at all. Only a few (15%) said that their online searches produced poor or misleading information. For all those who found a new place to live in the prior year, most (79%) feel they got the right amount of information in the process. One in seven (14%) say they had too little information and 5% too much. Most people who moved in the past year are satisfied with the choice they eventually made. Three-fifths (60%) say they are “very satisfied” and 28% are at least “somewhat satisfied.” Just 10% are either “somewhat” or “very” unsatisfied. 5% discussed their new place or neighborhood in an online forum or community. 4% posted comments or ratings online about real estate agents and others they dealt with in finding a place to live. 4% posted comments about their new place or neighborhood on a website or blog. 3% joined a neighborhood listserv. This comes to just 13% of internet users who moved in the prior year doing at least one of these activities. The internet plays a bigger role for those moving to another city. Most of the respondents who received questions on the process by which they conducted a change of address moved to another city; 53% say they did. The remaining respondents (45%) did not move to a new city or town. These two groups had substantially different search patterns, with the “distance killing” aspect of the internet coming into play for those moving some distance. The internet plays a noticeable role in introducing people who have changed cities to their new community. Some 63% of those who moved to a new city say the internet helped give them a good introduction to their new community compared to 46% of in-town movers who said this.